Send in photos. Press releases and other information sent are more attention-grabbing if they are accompanied by great, high-resolution pictures. Remember to send complete caption and identification information for each photo. The MBJ requires photos to be 300 dpi (dots per inch) resolution. If you’re unsure how to check an image’s resolution on your computer, just look at the size of the photo/image file. A high-resolution photo should be close to 1MB in file size (and may be a good bit bigger). If the photo is just 100KB (or less) or even 500KB, it’s probably low-resolution and won’t print properly. The Chamber's Montgomery Business Journal is the region's number one source for all things business. It features engaging content on local industries, quality of place initiatives and venues, regional impacts, news and updates on Chamber projects and activity, plus it highlights member's news, announcements and buzz. 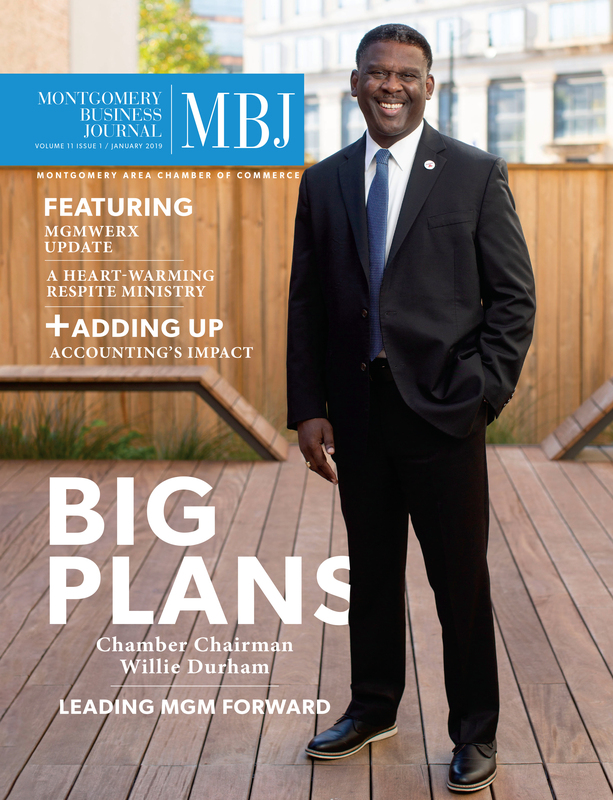 The MBJ is published 6X a year - January, March, May, July, September and November. There are 7,000 copies of each issue printed and all 7,000 are mailed and distributed locally. There is a full digital version of each issue online. Advertising is available and with enhanced ad opportunities, there are more ways than ever to get published in the MBJ. MBJ advertising is an exclusive Chamber Member benefit, and if you're not a member, it's easier than ever to become one. Join now online! The MBJ offers full-page and half-page ad placement with opportunities for premium placement. *Contact Christina Bennett to request a media kit (or download one below) and more information. Member Spotlights – a one-page Q&A article that gives an overview of your business and its offerings with two to three photos, plus contact information. Content Experts – a one-page article prepared by a member of your team that speaks to a specific business topic or answers a specific business question. Includes a headshot of the expert and contact information. *Contact Christina Bennett to request a media kit and more information. 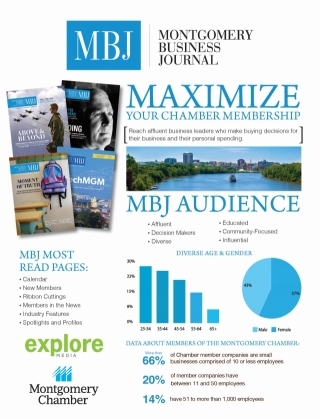 Are you a Chamber Member and want to get published in the MBJ? It's easy and FREE. We are always looking to spread good member news, so send us your new hires and promotions, awards, honors and special recognition, and all your business news and buzz. We'll get it published and printed in the next issue of the MBJ. Members on the Move – reports on new personnel hires and promotions. A high-resolution headshot of the person being highlighted is required for this section. Members in the News – reports on awards, honors and mentions in local, regional and national media. Business Buzz – reports on openings, expansions, additional services and anything else news-worthy that doesn’t fall into MOM and MIN. Giveback Briefs – reports on the philanthropic efforts and activities of our business community. Simply email a press release to Jina Miniard, Director of Publications by each issue’s submission deadline (below). If you don’t have a formal press release, that’s fine! Just send the pertinent information.